Image Suit is a professional image editing software that provides drawing tools, color and saturation adjustments, image and canvas sizing, and a good set of filters. Image Suit features 48 built-in image filters and supports user defined filters. Image Suit contains a toolbar and toolbox that you can move to your liking. Custom preference settings including toolbar/toolbox on off, default image locations, and many others. 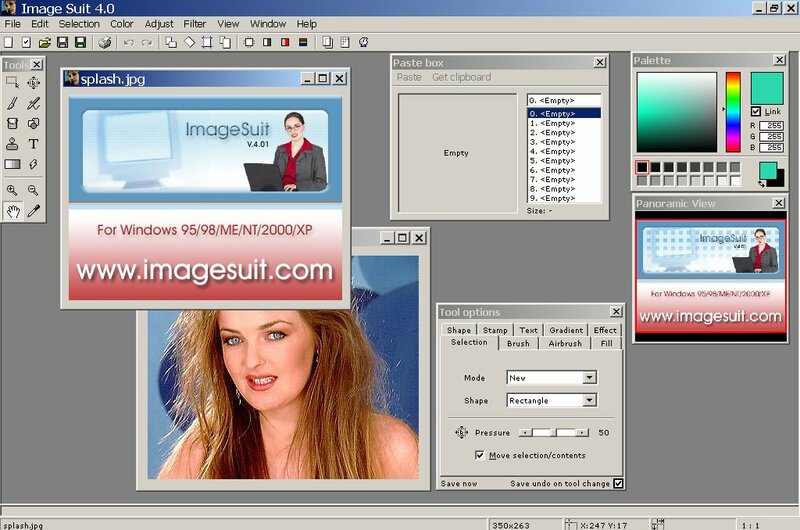 Image Suit also included is an industry-standard palette and color picker. Image Suit contains a toolbar and toolbox that you can move to your liking. Custom preference settings including toolbar/toolbox on off, default image locations, and many others. Graphics suite for optimization of visual image quality and compression ratio. Create horizontal and vertical scrollers easily; No JS experience is required. Full-featured, advanced batch image editing and conversion application. Qweas is providing links to Image Suit 4.0.1 as a courtesy, and makes no representations regarding Image Suit or any other applications or any information related thereto. Any questions, complaints or claims regarding this application Image Suit 4.0.1 must be directed to the appropriate software vendor. You may click the publisher link of Image Suit on the top of this page to get more details about the vendor.